To make this fritto misto, or mixed fry, start by cleaning the fish and the vegetables. Clean and peel the carrots, remove ends, then using a slicer or knife cut them into long, slanting strips. Wash the zucchinis, remove the ends, cut them into large strips, remove any white areas. Clean the aubergines, remove interior part, slice into segments. Completely clean the shrimp and fish, dry with paper towel. Put the squid tentacles aside, and cut the sacs into rings with a sharp knife. Heat the olive oil to 175°C in a large saucepan (or use a deep-fryer). Sift flour into a bowl, then coat the vegetables and the fish (separately) with the flour. Fry the fish and vegetables separately, making sure the oil level remains high and that it doesn’t get too hot; don’t put too much fish at one time into the oil, or it will lose its temperature. When the fish and the vegetables are golden (the shrimp and fish will take about 2 minutes, and 3 for the vegetables and the squid), drain well in a strainer then lay them on paper towelling to remove excess oil. 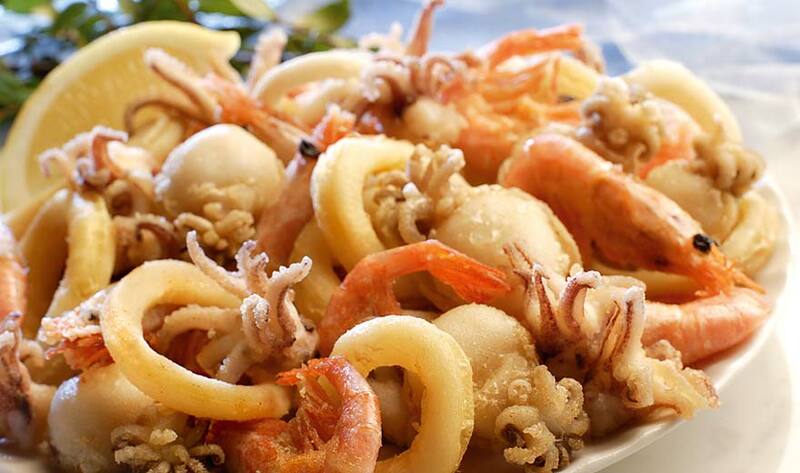 Remember to salt the fritto misto immediately after frying (never before), otherwise it will lose its crunchiness!